Does this need something more? So this is my first submission to this blog and I'm really hoping someone is still around :) Please be gentle. Overall I'm not too unhappy about how it turned out. The swirl didn't stamp very well but I'm more concerned about the layout and if it is balanced. I think it needs something on the left but nothing seems to work. Any ideas? Actually any suggestions at all for any part of the card would be welcome. I updated my "Should I throw this away" post below. Please let me know if I am on the right track. Thanks! This card (at least the pieces of it) has been sitting on my worktable for a few days. I used scraps of some Colorbok paper that were laying around my work area. I really like the 3 squares concept but I think my layout is off. I tried it with 1 square each in the 2 left corners being centered by the 3rd square but I didn't really like that either. Does the circle work? I thought it highlighted the greeting a bit but I'm open to ideas. FYI The actual card is a white base, the peach layer behind it is a manilla folder I put the card on to take the photo. Don't worry- even I wouldn't use peach with those colors! All comments appreciated. I learn so much reading your critiques. Here is the final card. It didn't turn out exactly as I had envisioned it but I like the 4 large squares. I'll need to experiment again with that type of layout. I started out sewing on a die-cut piece of turquoise card stock, then I decided I'd had enough, so I cut off the one side that was stitched, and then it went downhill from there. First I took a scrap of textured yellow card stock and punched it with a border punch. Then I added the yellow die-cut piece behind the turquoise. Then I looked for a scrap with yellow and blue in it, and I found that patterned piece of tissue paper. Then I added the Groovy Guava patterned paper to try and pull out the orange in the piece, and I mounted the whole thing on a piece of Basic Gray. Here is the piece next to a card so you can see the relative size of the thing. So what do you think? Should I put it out of its misery and just throw it away? or does it have at least one redeeming quality? And if you think it DOES have a redeeming quality, would you please tell me what it is? Isn't this a line in a kids song? Anyways, I need help. I cannot figure out how to finish this card. I'm not totally enamoured with the large flower to start with. Not sure if it is the coloring or what. Thanks for your comments. I've been playing around a bit...what do you think? The leaves are crudely stuck in and can easily be removed. This blog needs a little attention and affection AND I need your help. There's something missing or ??? with this card. What are your thoughts and suggestions? Thanks in advance! Thank you all for your input (yup, ribbon is possible, isn't it, Leslie!) and thanks Paula for this layout. I love it! And I want to try adding gold edging around another card sometime too Elizabeth. I have another masculine birthday card around the beginning of the year. I took your original design and did a bit of tweaking. I hope it is o.k. It is just easier for me to take the original and make a card to see if I can work with it. 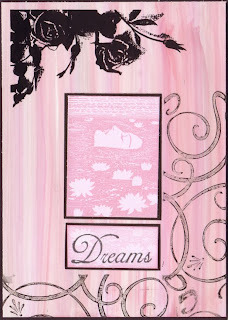 I do not have the stamp set you used but tried to keep the elements about the same size. I did change the card from Horizontal to Vertical to start with because it just was not working for me. The major change was more layers. It seemed that helped the focal point to stand out more. Fellow stampers, I need your help!!!! My neighbor (who's close to 82 and a delight) purchases custom cards from me and wanted one for her 25-year-old grandson's birthday. She likes very traditional-type cards and wasn't overly fond of my "Lovely as a Tree" designs in the past so I decided to stretch myself a bit. I think I overdid it and now have need of a bit of some assistance as I cannot stretch my poor brain any further. She ended up taking this one as she said that he would be much more interested in what was inside the card (a check) than the card itself and so was "happy" with it. I'll say "happy" as she didn't gush over it but when I said that it was only partially done when we were having tea one afternoon and showed it to her, she told me to consider it finished as he would be happier to see the check. I have to admit that her telling me that he would be more interested in the contents than the card took some of the joy out of making it but I'm still thinking about it and want your opinions on how I can improve it. I'll make another with your suggestions and keep it available for another masculine birthday which we all know will occur sooner or later! I like this background and I like the chocolate cupcake. What should I do for the birthday sentiment? Any ideas appreciated- this has been sitting on my stamp table for a week. And his birthday card isn't finished. Believe it or not, my husband's birthday is today and here I was without a card this morning. Fortunately, he went running with his buddies before I woke up and since they were running a 13-mile route (yes, THIRTEEN), I had some time. Turns out that I didn't have enough though as I couldn't figure out how to put the sentiment on. I finally just slapped it on as he was walking in the door. How can I fix it? Yes, I thought about ribbon, Leslie, but only have 5/8" chocolate chip grosgrain and none of the bows I tried worked. I did have a thought a second ago...maybe natural hemp. I still don't know how to best layer/make the sentiment...HELP! Thanks to your comments, I've come up with this version. I'm still not 100% about the shape of the sentiment (feel free to add input as I learn so much from everyone's comments) but I do like this version. I actually finished the card last week and my husband sent the gift today. No big rush... the baby was born 8-30. No matter how long you have been stamping, we all get stuck- that certain point on a card or project where we could use advice on colors, layout, embellishment or whatever. This is a place to post your "in progress" artwork for an honest, constructive critique from fellow paper artists. Anyone is welcome to comment on any artwork at anytime- the more the merrier. Comments from non-members must be approved to protect us from SPAM. If you would like to post your artwork for critique or join as a member please leave a comment on a post.